What are the qualifications for being a Freemason? What Freemasonry is not. . .
Freemasonry is the world’s oldest and largest Fraternity. Its history and tradition date to antiquity. Its singular purpose is to make good men better. Its bonds of friendship, compassion, and brotherly love have survived even the most divisive political, military, and religious conflicts through the centuries. Freemasonry is neither a forum for, nor a place of , worship. Instead, it is a friend to all religions which are based on the belief in one God. The system of morality referred to undoubtedly includes principles with which candidates are more or less familiar before their entrance into Masonry. They, nevertheless, find these principles presented in new ways and under forms different from those which they have known in the past. The essence of morality is to be found in the utter simplicity (though not the ease) of Masonry’s requirements. Symbolism reaches a high degree of development in Freemasonry, and is largely responsible for its universality. Men of different tongues may find it difficult to reach a common understanding; but symbols enable all men to comprehend each other without the necessity of any spoken word. The symbolism of Freemasonry deals with the intellectual, moral, and spiritual values of life. There is nothing of a light or trifling character in Freemasonry. Any intimations to the contrary are patently false. A Masonic Lodge is a place wherein members are content to love and serve their brothers, to honor their God, and to learn the many lessons that Masonry seeks to teach. Many of our nation’s early patriots were Freemasons--George Washington, the Marquis de LaFayette, Benjamin Franklin, John Hancock, Paul Revere, John Paul Jones, Rufus King, James Otis, Baron von Steuben, and Joseph Warren--as were 13 signers of the Constitution. Fourteen Presidents, beginning with Washington, and 18 Vice-Presidents were Masons. Five Chief Justices of the U.S. Supreme Court--Oliver Ellsworth, John Marshall, William Howard Taft, Frederick Vinson, and Earl Warren--were Freemasons, and the ranks of Masonry have included a majority of Supreme Court Justices, of Governors of States, of members of the U.S. Senate, and a large percentage of members of the U.S. House of Representatives. Famous Masons include Simon Bolivar, James Boswell, Robert Burns, Edward VII, Giuseppe Garibaldi, George VI, Goethe, Rudyard Kipling, Haydn, Mozart, Will Rogers, Sir Walter Scott, Jean Sibelius, Voltaire, and many others. The Freemasons of America contribute more than one million dollars every day to charitable causes which they, alone, have established. These services to mankind represent an unparalleled example of the humanitarian concern of this unique and honorable Fraternity. In most Masonic Jurisdictions, an individual must ask a Masonic friend to recommend him for membership. He must sign a petition, stating his age, occupation, and place of residence. Members of the Lodge vote by secret ballot which, in most Jurisdictions, must be unanimous. 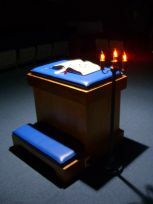 Most Masonic Lodges meet at least one evening a month to conduct their regular business and vote on petitions for membership. It is here that the bonds of friendship and fellowship are strengthened. A Candidate receives three Masonic Degrees, concluding with the Third (or Master Mason’s) Degree. The Degrees are solemn, enlightening, and an enjoyable experience with no uncomfortable or embarrassing moments. It is here where the principles of Freemasonry are taught and where the new member learns that his family and his livelihood are to be considered above Freemasonry. Every Master Mason is welcomed as a “Brother” in any of the thousands of Regular Masonic Lodges throughout the world. Freemasonry is not a religion. It has a philosophy of its own that is in harmony with churches, schools, and all other worthy institutions. The teachings of the Fraternity transcend all denominational and sectional divisions. Its sympathies are as broad as humanity. Freemasonry is not, itself, a charitable institution. One of the fundamental principles of Freemasonry is the practice of charity and a Mason necessarily contributes to the relief of the afflicted according to his ability, but this and similar modes of conduct must proceed from a purity of life and conduct that is one of the great objectives of all Masonic teachings. Freemasonry does not insure its members against the detrimental effects of old age, provides no sick benefits, issues no policies on the lives of its members, and pays no death benefits of any kind. The matter of individual relief is confined to those cases where it is necessary, in spite of all the efforts of a brother or of his family to maintain economic independence. A member’s part in this procedure is far more likely to be that of a contributor rather than a beneficiary. Freemasonry does not lend itself as a means of promoting selfish interests. Any underlying purpose of such a nature will eventually become apparent to other members and one will eventually suffer the loss of their respect as a result.